This year the committee worked cooperatively with other groups in the community and local authorities to further the interests of the residents and the community. We completed updating our Village Plan and presented it to Porirua City Council. This will guide our planned work over the next two to three years, in particular projects such as the Green and Gold Trails and the community gardens. One of the items in the plan, a new playground at Greenmeadows Reserve, has been installed and is proving popular with older children. This was completely decommissioned this year and security fences were installed. After discussions with KiwiRail, the Residents’ Association took over responsibility for the smaller shelter from the northbound platform. This was moved temporarily to Pamela Meekings-Stewart’s property at the old woolshed in Muri Road. The intention is to use this for a community facility, possibly associated with a community garden or Te Araroa Walkway. A safe footpath was built running from the southern end of the southbound platform to Muri Reserve as part of the decommissioning. This fixed a problem the community had with KiwiRail blocking off access from Muri Reserve to the tracks. This is a popular walking route and people are pleased that it is now open and safe to walk along. The focus in this area in the past year was the Transmission Gully Board of Inquiry, to which we submitted. Our submission requested that the safety measures outlined in the Neighbourhood Accessibility Plan be implemented on the existing State Highway before the road is handed over to Porirua City Council when the Transmission Gully Road is completed. Although many people were pleased that the Transmission Gully road will be built, we need to maintain pressure to ensure we get the safety measures we need along State Highway 1 as soon as possible. The shared pathway through Pukerua Bay alongside the State Highway is making progress, and we will continue to work with PCC to ensure that this is completed. It is essential for safe access for pedestrians and cyclists through Pukerua Bay. We are making intermittent progress on this project. A group of committee members is working with Margaret Blair and Tony Jackman, who developed the concept for the trails and have done the research into the sites and their significance. We were fortunate to get much of the timber from the old Airlie Road bridge to use for structures such as bollards along the trail. This was as a result of Margaret and Tony approaching PCC a couple of years ago to ask for the timber for use on the trails. Work will start next year on installing bollards along the trails and on interpretive materials to support the trails. We have developed a project plan to guide this work and a Memorandum of Understanding that we will sign with PCC to make our obligations clear. This project is almost complete. However, a significant structure about to be unveiled is a large pou whenua that is being installed at the southern end of the foreshore. It is being carved by a local carver, Hermann Salzmann. When this is in place, it will be a significant monument in Pukerua Bay. We have an active team of civil defence volunteers in Pukerua Bay, organised by our Civil Defence coordinator, Robyn Moore. They are a keen part of the wider Porirua emergency response group, and an essential group in helping our community prepare for any emergency. In the past year they have completed the Pukerua Bay Emergency Management Plan, which will increase preparedness and resilience in the community. It was great to see many families and the Pukerua Bay School taking part in the “shake out” exercise in September. Practising what to do in an emergency is an essential part of being prepared for any disaster. We would also like to note the passing this year of Brian Staniland and Ruth Franks, two civil defence stalwarts in our community, and acknowledge the contribution they made to preparedness in Pukerua Bay over many years. The committee has kept in close contact with the Pukerua Bay pre-school and Wellington Free Kindergartens over their plans to expand the pre-school building. These plans have been put on hold due to lack of money, and the centre now faces likely closure if funding cannot be found to extend the existing building or to build a new centre on another site in Pukerua Bay. The Committee has resolved to support the pre-school’s efforts, in line with the strong support the community expressed for pre-school facilities in the Village Plan survey. It would be a great loss to the community if this well-run and long-standing facility closed. This was an important issue for us this year, and will continue to be significant for communities throughout Wellington. Planned legislative changes have the potential to change the role of local government and its relationship with communities. We have represented the community’s interest by emphasising the importance of community involvement in local government and the need for us to be actively involved and have a say in creating the community we want. We will continue to stay active on this issue to represent the interests of the community. Our work in this area has taken two forms: Preventing poaching and working towards permanent protection of the Bay. We have supported the Ministry of Fisheries by encouraging residents to “dob in a poacher”. We have also kept in contact with representatives of Ngati Toa Rangatira as they have negotiated their settlement with the Crown. Ngati Toa supports the continuation of protection in the Bay. Now that the settlement has been agreed, we will continue to work with Ngati Toa on appropriate mechanisms to ensure we get permanent protection of the fishery in Pukerua Bay. A keen group of people in the community has been researching community gardens in preparation for developing one in Pukerua Bay. A likely site would be in Muri Reserve, next to the old station platform. In the longer term, it is hoped that this area could be developed further into a large garden and recreation area that the community would use. There is a growing interest in community gardens in Porirua, and many resources available that communities can use to develop their own gardens. We have developed a comprehensive vegetation and landscape plan in response to concerns residents have with some aspects of current environmental care practices. 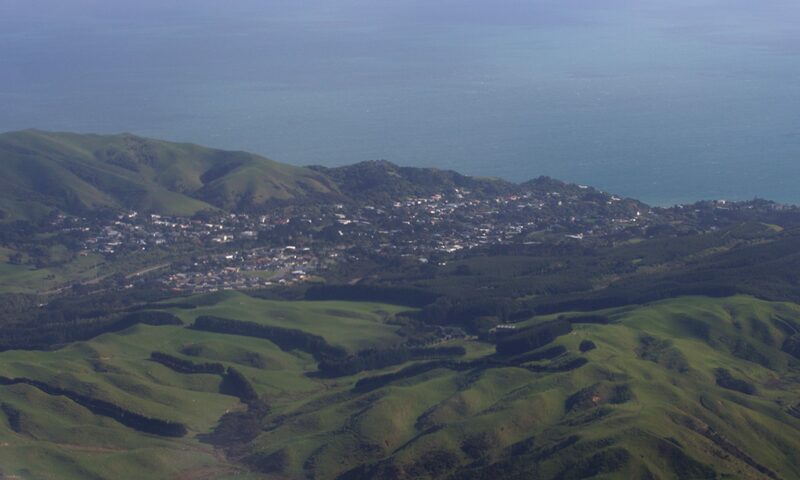 The Village Plan outlines actions that are required to achieve improvements in this area and the vegetation and landscape plan aims to improve coordination between groups that are responsible for managing the natural landscape in Pukerua Bay and provide opportunities for community participation. Our intention is that this will improve communication between various stakeholders and encourage residents to deepen their involvement in caring for their environment. Our next steps are to seek engagement from the wider community and to get authorities that manage vegetation on their land, such as PCC, NZTA and KiwiRail, to become active participants in the plan. We gained several new community facilities, for which we are grateful. We wish to thank PCC for their role in providing them or obtain them for us. In particular, the new toilet block at the shops is a welcome new facility, and we are pleased that PCC engaged with us and the local shop owners on the design. The new bus stop at the top of Pukerua Beach Road is a more attractive structure than the old one. I want to thank the members of the Executive Committee – Gill England, June Penhey, Robyn Moore, Kate Dreaver, Dagmar Pesendorfer, Pauline Morse, Ted Coats and Jonathan Jull – for their work this year. The committee is a team effort and everyone has a role to play in our successes. On behalf of the committee and the Residents’ Association, I would like to thank the Regional and City Councillors and Council staff who support our community and attend our meetings. We have a productive working relationship with them, and we especially value the support we get through PCC’s Village Planning programme.